Ouch is right. Oh my gosh, ouch. Either way. MUCH LUCK TO YOU!!! yay babies! 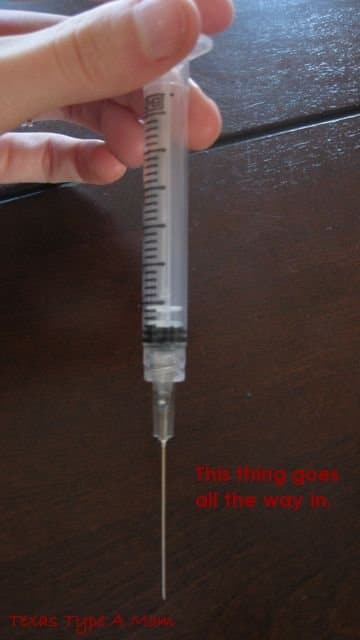 Holy crapola that is a long needle! Best of luck! I am so glad I never had to do any of that stuff when I was pregnant! ohh sister! I am sending many prayers your way that you will not have to do this for long! Hope you are having a good Wednesday besides this. I admire you so much for having another one after everything.. I just don’t knowif I am as brave as you! 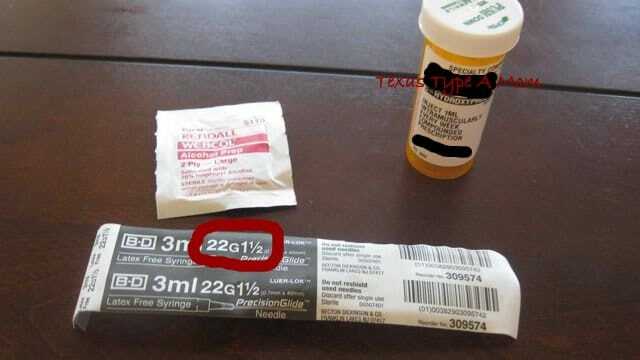 I sooooo don’t miss those needles! I am sick of needles, but for a different reason now. saying prayers for a safe baby for you! O!M!G! You are my hero right now… not sure if I could handle that!!!! Ow Ow OWWWW!!! You are so brave! I’d be a whining mess! Thanks! It’s no fun but most definitely worth it! My OB actually suggested my legs because there’s so much muscle there he said it’d be easier. But maybe that was just easier on me if I was giving them to myself? I can’t stomach giving them to myself though so my mom drives over to give the to me. This last shot wasn’t as bad – I read that scratching next to the needle while it was injected confused the nerve endings and the pain is very minimal today. My last shot was sore for the entire week – good thing I’m alternating legs. It’s so not fun but definitely worth it. This is my third shot and I’m already getting used to it. You’re so lucky! I had my daughter at 31 weeks so we’re hoping to avoid pre-term labor this time so I’ll have a total of 20 shots. Three down, seventeen to go. I have to do this for 20 weeks (from 16-36 weeks). It’s not going to be a cake walk but if we can avoid another NICU stay I’ll be happy! I’m just trying to have faith that God is going to guide my doctors into giving me the best course of treatment possible and giving this baby a less stressful entry into the world. T-Bird is still young, you might change your mind when he gets a little older. Cakes will be 3 before this baby is born. Thanks! This was shot three I was taking pictures of. The first shot was pretty bad and I almost passed out (empty stomach and the pharmacy gave me the wrong sized needles). My moms giving them to me now but I’m hoping I can work up to giving them to myself so I can spare her the weekly trip. So you had the shots with the twins? How long after stopping them did you go into labor? Oh Kelly…this is why you are a good mama, you do what you have to for your kidlets! Oh, that doesn’t seem fun! The things we do for our kids. Sending prayers for a safe pregnancy. I had to give those to a friend once and I did them in her belly. I did all my insulin shots in my thigh though. It was just easier for me to have control there. This is progesterone suspended in oil and has to be given into the muscle. Thankfully these are just weekly and not daily. For fertility right? That is what I was giving her I believe. She was getting eggs extracted. Same thing or no? I’m already 18 weeks pregnant but have a history of pre-term labor. The progesterone has been proven to prolong pregnancy so I’ll continue these until 36 weeks. You are brave. I have tattoos, but I could never use a needle on myself, I would have to have my husband do it. Does not look fun, but hopefully it helps! Ouch! Best of luck, and at least is is only once a week. OMG I can’t stand needles and don’t know what I’d do if I had to give myself shots. But its all worth it I’m sure!!! Oh gosh hugs to you, and best of luck! Ouch, it will be worth it though! I did the fertility treatment. I recall the doctor giving me a suppository of progesterone. I can’t remember how long maybe for a few months? I know it wasnt for the full term. I was pregnant with twin girls. They are six right now. Unfortunately one of the girls had a stroke in utero and is severally disabled. The stroke wasnt detected until she was 2 weeks old. Never had any symptoms of anything wrong. I delivered my girls at 36 weeks only because of twin b having dropped in weight since the last ultrasound. My girls are the best!! I ended getting pregnant without fertility 3 years later. 3 beautiful girls. I did the needles every month, clomid didnt work, so i had to use the “pen” with the help of Artificial insemination. 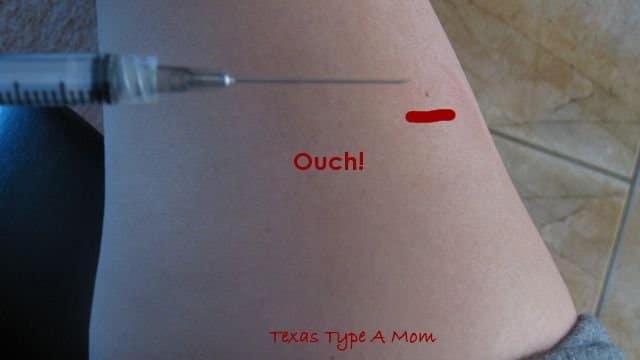 I have such a fear of injections–I feel for you. 🙁 It will all be worth it in the end though! I haven’t managed to give myself a shot yet. I’m hoping to work up to it to spare my mom the drive, but for now she’s driving to me once a week to do them for me (she’s a nurse and can handle it). The day I told you about it I got a flu shot and had blood drawn too. But then there’s also this and the needle goes all the way in my leg. oh no! I hope it works and keeps baby cookin’! I *think* the progesterone in oil is only common if you have a history of PTL. I’ve heard a few cases (on birth boards) of women going into labor immediately after d/c’ing the shots. But most OBs stop them between 34-36 weeks if you make it that long but better a late-term preemie than earlier. You make a great point, hopefully the shots are working in your area and the babes aren’t ending up with you! My OB is pretty convinced that my abruption is what brought on the PTL, but we’re doing everything we can to prolong this just in case. OH MY….bless your heart! You will be in this Granny’s thoughts. I send all my love to you and the baby.